Have you ever noticed that in Jordan, you "give" someone a missed call. It's one of things that the first time I heard it struck me a really strange. Now, I even use it myself. But think about it, we say it as if we're giving someone the most precious gift. Okay, I'm giving you a missed call. When you try and express the thought properly in English (for those not from here), it's convoluted and almost painful. You know, listen, I'm going to call you but don't answer and then you can save my number. How inelegant is that? So, back in November, El 3atal gave himself an early Christmas present. He bought a new cell phone. For a little background, you may recall my post on cell phones and the fact that in the US, I kept the same cell phone for 5 years. I'm the bain of the cell phone companies' existence since I rarely buy new hardware. Mid-last year, I did buy a new cell phone to replace the awesome Motorola I had purchased when we first moved here. The Motorola is still a great phone, but somehow I managed to get something caught under the 0 key. And, you can't do much without a 0 key in Jordan. Then the little button in the center popped off and I decided it was time to feed my wish for a pink phone. I know by now you're wondering what this has to do with El 3atal's phone aren't you? Bear with me. So, I bought a Samsung to replace my Motorola and so far have been very happy with it. But, El 3atal has always been a bit of a snob about his phones and buys Nokia. So, his latest phone was the newly released, fancy slides-open-from-the-side, cool phone. And he paid a pretty penny. So, about 3 weeks after getting his new phone, the flash on the camera started glowing red for no known reason. El 3atal took it into Golden Mobile since they are the only ones who are authorized to fix Nokias here. Unfortunately, this has proven to be quite an ordeal. El 3atal dropped off his phone a few days before Christmas and was told it should be ready in a week. At the end of that week, he called and they said they were missing a part and waiting on it to arrive, it should just be one more week. This went on... and on... and on. Finally, a little over a week ago, when Golden Mobile has actually had his new phone LONGER than he had and were still "waiting on a part and his phone was with level 3" we went in to pay them a visit. Several times over the seven weeks of waiting, he had spoken to the "manager" of customer service. The answers and service he received from this chap were lackluster at best. When we got to the office, the chap at the Complaines desk (yes, I suppose that must be complaints) tried to foist us off with a "the phone is waiting on a part and it'll be ready in two more days." As you can imagine, we weren't buying it. After seven weeks of one more week and a couple of days, I simply was unable to believe any promise date they provided. We asked to see the manager. The manager came out and he and El 3atal began to discuss the situation. now, of course the manager remembered El 3atal after his many conversations and tried to explain to him that it isn't their fault. They're waiting on the part and, yadda yadda yadda. El 3atal explained to him that he understood all that, but it simply was insufficient to tell a customer that you don't have the part after 7 WEEKS! Finally, I felt I had to get involved in the conversation. I explained to the young fellow that Golden Mobile's poor customer service has led to El 3atal - a loyal Nokia customer - stating this phone was his last Nokia purchase. And, the reply highlights the root issue. The manager said to me, but this isn't a customer service issue, it's a parts issue. AHHHH, so NOW I get it. This fellow and, one would presume, his management chain, have been led to believe that customer service consists solely of being nice to the person when you tell them they need to keep waiting indefinitely and you can't help them. I assure you THAT is a problem. I worked in telephone customer service during the summer and during my last year of college. If I was simply a nice voice to tell them, I understand you didn't want that book but so what, I'd have been fired. Customer service is about HELPING the customer - not telling them why you can't help them. If I wanted the customer excuses department, I'm sure they'd be easy to find. But I wanted customer service. So, we need to change two fundamental things. First, customer service representatives need to understand that their role is as a solution maker. They need to be finding ways to make the customer happy. If their cell phone problem relates to a part not being available, offer them an identical loaner. Or, better yet, after week 3 replace their phone. When I asked for the manager of customer service to make an identical loaner available for El 3atal while he waited on his repair, he actually told me, well, we don't have any of his model in stock as loaners. Well, I really don't care about your internal stocking as the customer, now do I? I explained that he needs to go get one off the shelf then, if they can't simply replace the thing. After it became clear that El 3atal and I were literally not budging until this issue was resolved to our satisfaction, they went up the management chain (which we'd be trying to do for weeks, literally). Turns out they finally decided they could find a replacement phone and would have it on-site the next day along with the parts from El 3atal's old phone that he needed. They did manage to follow through on that and El 3atal has a different phone. Customer Service representatives are not empowered to take any steps to actually resolve the customer's problem. They are expected to continue in a holding pattern making excuses to the customer. yourself an extra time to allow for surprises. information and power to make those small customer-pleasing decisions. are not robots, customer sometimes come for the interaction and the atmosphere. Is there anyone, other than drivers of dignitaries, who doesn't realize that 1:30-2:30 is a terrible time to move people around town safely? For two days running, I have had the... let me think of the word... pleasure? joy? annoyance... yeah that's the one annoyance of being on Zahran Street at the same time as some dignitary of note. I don't know who it is, some fairly ordinary-looking guy in a car with government plates with the lowest possible number. He's accompanied by two American sedans with tinted windows. I'm betting on the Primate Minister, but... what would I know? Now mind you, we're talking at the peak traffic time for school pick up and bus routes. Anyone who's driven the streets of Amman knows that any day between 1:30 and 2:30 (or 3 maybe) traffic is a disaster all around town. This is particularly true of Zahran Street. Now, these fine fellows don't try and push traffic behind them like the uber-annoying black Suburbans, instead they come up from behind and try to edge you out of your lane. Mind you, this on a street with a high-curbed median and constant traffic. There is no shoulder, there is nowhere to slow or stop. There are only cars, cars, and more cars. So, what I want to understand is, who is the member of intelligentsia that, upon seeing the mess that is school pick-up traffic on one day decided let's jump out in it and risk life and limb of ordinary Jordanians again tomorrow? If your guy is that important, reschedule so you get in and out before this traffic. Otherwise, admit it, the cars with him running folks off the road are probably overkill. To be totally honest, if the fellow hadn't had the run-off-the-road cars and was simply being driven in a big Merc, I wouldn't even have noticed. Those are a dime a dozen. I have a feeling there is something to be said for public figures who find a way to blend in, rather than stand out and inconvenience the populace. But, that's just me... Maybe others find the experience exhilarating. If I could offer a word of advice, for those who really, truly are worried about attempts on their life, don't go out in Amman from 1:30-2:30. Stay home or at the office or wherever. Because, as a resident of these crazy, wild, exciting streets I can assure you, there is no controlling them. They are like an act of nature (think hurricane, tornado, tsunami). And, anyone who plans to control the streets for a dignitary might as well just close them down, because otherwise I'm afraid it's a lost cause, teehee. As for me, I just hope that Mr. Important is done gumming up traffic on my route so that today's afternoon commute goes more smoothly. And, as a good example of what TO do, on my way home this morning after dropping off the Beans, I saw a Suburban brigade taking someone mportant somewhere. They had waited until almost 9 when the streets are as empty as they get during the day. There was no need to run folks off the road as there just weren't that many folks. Maybe a little less aggresion and more planning is the ticket? You Mean You DON'T Have a Snowman on Your Car? 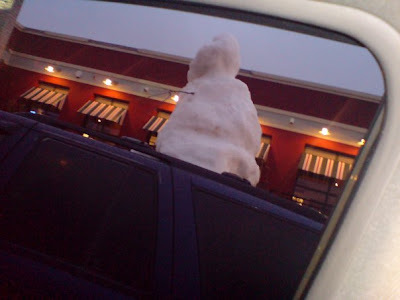 Personally, I think a snowman is the car decoration for 2010. I'm only wishing I had one. I hope you enjoy the picture as well. Is that a Dummy in the car, or are you the Idiot? This headline caught my eye this morning for one simple reason... I SO though about doing this before. Back when we lived in big city America and I commuted an hour each way every day, I watched the folks zooming past in the HOV (high-occupancy vehicle, aka carpool) lanes, and thought about getting an HOV dummy. There were a couple of things that held me back. First, we didn't have the money for one. Second (and more important), it was hard enough dressing myself, no way I'd manage to get 2 of us dressed and out the door early in the morning, teehee. I also thoughts about the type of explanation that would be required if a police officer did pull me over and decided I'm not that good at pulling a fast one. Smooth-talker I am not. So, I never implemented this HOV plan. Now I see that someone else did and got ticketed for her trouble. Well, I guess the question in the case is - who is the bigger dummy? So, since my 50 things post only took me through the first two yeas of my blog, I had to ensure that as my love affair with Jordan changes, those changes are represented. So, I figured in for a penny in for a pound, and here's the pound. Snow mermaids, where else could you make them and not have them be the most unusual thing on the block? The fact that people won't use crossing bridges over airport road, but I have actually seen a herd of sheep using it! Speaking in Arabic makes people assume you're anything but American (I've had French and German in the last 2 weeks or so), although what does that say about us Americans?